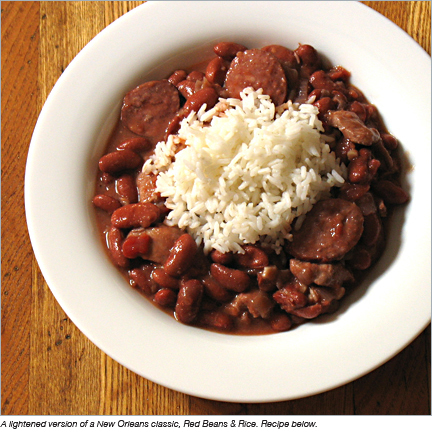 This recipe is featured on pages 116-117 of the 2001 Frommer's Guide to New Orleans. Soak the beans overnight, if possible. The next day, drain and put fresh water in the pot. (This helps reduce the, um, flatulence factor.) Bring the beans to a rolling boil. Make sure the beans are always covered by water, or they will discolor and get hard. Boil the beans for about 45 - 60 minutes, until the beans are tender but not falling apart. Drain. While the beans are boiling, sauté the Trinity (onions, celery, bell pepper) until the onions turn translucent. Add the garlic and saute for 2 more minutes, stirring occasionally. After the beans are boiled and drained, add the sautéed vegetables to the beans, then add the ham hock (or ham or pickle meat), smoked sausage, seasonings, and just enough water to cover. Bring to a boil, then reduce heat to a low simmer. Cook for 2 hours at least, preferably 3, until the whole thing gets nice and creamy. Adjust seasonings as you go along. Stir occasionally, making sure that it doesn't burn and/or stick to the bottom of the pot. If you can ... let the beans cool, stick them in the fridge, and reheat and serve for dinner the next day. They'll taste a LOT better. When you do this, you'll need to add a little water to get them to the right consistency. Serve generous ladles-ful over hot white long-grain rice, with good French bread and good beer.